Somewhat in the same vein as my post on real-time communication challenges earlier in the week, but more work-related, I spotted there was an addition to one of the posters in the exhibition area today. 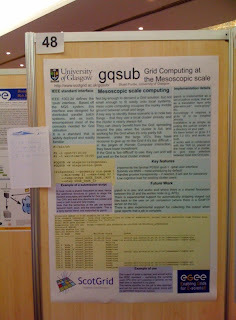 The poster is on a system called gqsub, which lets many people that use local clusters with the qsub command make use of Grids instead using almost identical tools. "People used to clusters to be able to be using a Grid instead in fifteen minutes," said Stuart Purdie, the author of the poster. "Not everyone," he added, "power users should still use gLite properly but for many day to day users this might be an option." From my place on the EMI stand, I have seen his poster has been gathering quite a lot of interest, and Stuart has been in conversation with lot of passers by. It seems that Stuart has been listening to them as the poster now includes the note below, on work he has been doing during the conference. 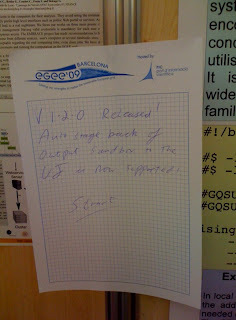 For those having trouble seeing, it reads "V 1.2.0 Released! Auto stage back of output sandbox in the UI is now supported!" As Stuart put it, "Patch the code, patch the poster!"